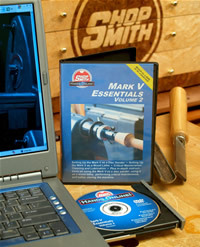 Here’s Nick’s follow-up to our MARK V Essentials, Volume 1 DVD/DVD-ROM. The perfect companion for the Volume 1 edition, it’s must-have information for anyone who has recently purchased or inherited a used MARK V…or recent buyers of new machines who would like to see a machine put through its paces. Disc Sanding with both our standard Flat and our optional Conical sanding discs. He’ll discuss using the Flat Disc at the center of the MARK V Worktable, as well as at the outside edge for both straight and convex edge sanding and how the Lower Saw Guard can be used to keep shop dust at a minimum. He’ll also introduce you to our amazing Conical Disc and the unique operations that only it can perform. Lathe Turning, including how to set the MARK V up in Lathe mode, align its components for the best results and mount the workpiece properly. Critical Maintenance Procedures, including cleaning & lubricating the Headstock & locks; Quill; Speed Dial; Worktable & Cariage; Way Tubes; Extension Tubes & locks; Miter Gauge; Rip Fence; Saw Guard; and Lathe Tool Rests & Posts.